Hanoi (VNA) – Vietnamese artists will join German and Japanese peers in a special concert at the Opera House in Hanoi on April 14. 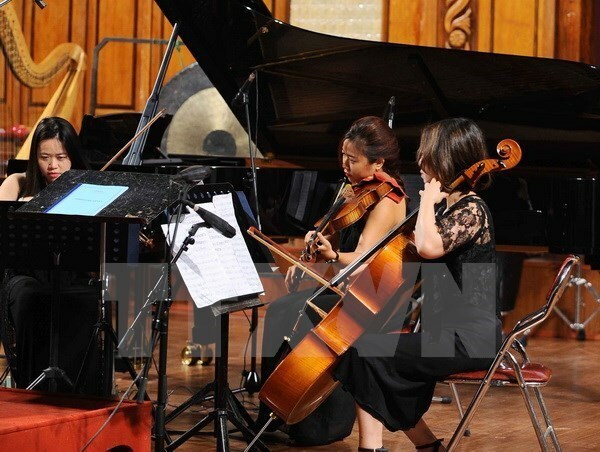 Jointly organised by the Vietnam National Symphony Orchestra (VNSO), Goethe Institute in Vietnam and the Japan Cultural Exchange Centre, the Subscription Concert Vol. 100 aims to celebrate the series of 100 concerts staged by the orchestra over the past 12 years. Together artists from VNSO, the concert will see the participation of the bugler Premysl Vojta, the trombonist Michael Massong and the trumpeter Martin Griebl from Germany’s WRD – Sinfornieorchester Koln with famous Japanese oboe artist Maekawa Kosei as special guest. Under the leadership of conductor Honna Tetsujin, the artists will perform “Tieng vong” by musician Do Hong Quan and the Symphony No. 7, also called “Leningrad Symphony”, by Russian composer Dmitri Shostakovitch. Founded in 1959, the VNSO has played about 60 concerts worldwide every year.